What is an Aquatic Nuisance Species (ANS)? An aquatic nuisance species is a nonnative species that has been introduced and is known to be causing ecological or economic harm. Not every nonnative aquatic species is a problem. Some don’t occur in great numbers or create significant ecological or economic harm; others have important commercial or recreational value. Why are ANS a Problem? North Carolina has abundant and diverse water resources. Protecting them is important to support the state’s unique biological attributes and growing population and economy. Nationally, economic loses attributed to ANS total billions of dollars annually. How did ANS get in North Carolina? 75% of the ANS in North Carolina have been introduced from other areas of North America. Humans are the cause in nearly all introductions, either through unintentional or deliberate actions. Over 60% of ANS fish species in NC were introduced by intentional stocking or bait release. Additional pathways include direct stockings from private aquaculture facilities into public waters, cultivated species cultivated species that escaped captivity, “hitchhiking” on recreational or commercial watercraft, and aquarium releases. While there are more than 300 species of freshwater and marine plants, animals and pathogens currently in North Carolina, below are the ones anglers, boaters and outdoor enthusiasts are most likely to encounter. We urge everyone to know what they are, how to identify them, and how to prevent their spread. Whirling disease and gill lice are two aquatic nuisance species found in trout in western North Carolina, while didymo is a nuisance algae that has been seen in the Tuckasegee River in Jackson County. Hydrilla, an highly invasive aquatic plant, is found in freshwater lakes and ponds across the state. Learn more about each of these below. Myxobolus cerebralis (the parasite that causes whirling disease) was first confirmed in North Carolina in July 2015 from a Rainbow Trout collected from Watauga River near Foscoe, Watauga County. Whirling disease damages cartilage and skeletal tissue in a fish, causing it to swim in a whirling motion. While often fatal to juvenile fish, the disease does not infect humans or pets, and eating an infected fish is not known to cause any harmful effects. The NCWRC will continues to work with researchers to explore the distribution and life history characteristics of Myxobolus cerebralis in North Carolina. In September 2014, gill lice (tiny, white copepods that attach to a fish's gills) were documented in North Carolina. Elsewhere within the United States, Salmincola edwardsii and S. californiensis are known to parasitize salmonids of the genera of Salvelinus and Oncorhynchus, respectively, and taxonomic and molecular analyses of copepods confirmed the identification of both species in the State, with S. edwardsii infecting Brook Trout and S. californiensis infecting Rainbow Trout. Gill lice can traumatize gills and inhibit the fish’s ability to breathe. While most fish are able to tolerate a moderate infestation of gill lice, if they’re suffering from other stressors, such as drought and high water temperatures, population impacts are more likely to occur. Anglers have been asked to report observations of gill lice during recreational outings, while the NCWRC continues to sample Brook Trout and Rainbow Trout populations across the mountains of North Carolina to document the distribution and status the copepods. Researchers from Tennessee Tech University collected cells of the microscopic algae in Tuckasegee River, Jackson County, while conducting regional surveys in late 2015 – the first time the organism has been documented in North Carolina. Didymo, also called rock snot, is the common name of Didymosphenia geminata, a freshwater diatom species that can produce thick algal mats along stream bottoms. The mats can be so thick that they alter stream habitats and make fishing difficult. Aquatic nuisance species are plants and animals introduced into waters that cause ecological and/or economic harm if established. 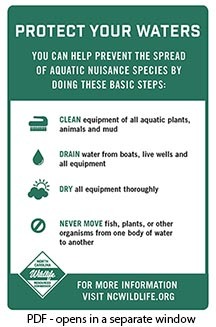 Aquatic nuisance species include whirling disease, didymo, gill lice, hydrilla, zebra mussel, giant salvinia and many others. CLEAN: Equipment of all aquatic plants, animals and mud. DRAIN: Water from boats, live wells, bait buckets and all equipment. NEVER MOVE: Fish, plants or other organisms from one body of water to another. To protect native or legally established aquatic species from the potentially damaging effects of unauthorized stockings, the N.C. Wildlife Resources Commission requires anyone wishing to stock a public, inland fishing water in North Carolina with fish, mussels or crustaceans to obtain a stocking permit issued by the agency's Inland Fisheries Division. Learn more about Fish Stocking Permits.